Did Samuel Clemens (Mark Twain) Meet Thomas Sawyer of Lee County, Iowa Before He Wrote The Adventures of Tom Sawyer? The writers of this essay, Ann Stroupe and Jim Ramsey, are descendants of Thomas SAWYER and his wife Eliza SNODGRASS who were Lee County, Iowa residents. Thomas and Eliza are buried in Oakland Cemetery in Keokuk. We feel that accumulated evidence shows a very strong likelihood that our Thomas Sawyer could have personally met Samuel Clemens during his residency in Keokuk through common connections with Sam's relatives or in-laws in Lee County, business meetings, or at least had his name become known to Sam Clemens through newspaper accounts, well before Sam sat down to write his first book Tom Sawyer. Generations of our Sawyer families have passed down stories about meeting Mark Twain. Thomas Sawyer is Ann Stroupe's 3rd great grandfather and Jim Ramsey's 2nd great grandfather. A resident of Lee County, Iowa from 1850 to 1892, Thomas owned property and lived in Pleasant Ridge Township, Montrose Township, and Keokuk, the town where Samuel Clemens lived and worked in his brother Orion's printing shop in 1855-1856. Thomas Sawyer ran for and was elected to the Iowa State Legislature during the time Sam Clemens was in Keokuk. It is certain that Thomas knew several of Sam Clemens' relatives who lived in Lee County. The Clemens family (Sam, his mother Jane, brother Orion, and Orion's wife Mollie) were very close to and in regular contact with their many relatives who lived in Lee County, Iowa, both through written letters and in-person visits. Thomas Sawyer's wife was Eliza Snodgrass. Eliza's parents lived in West Point, Iowa from 1850 until their deaths in 1860 and 1877. They are buried in the West Point Cemetery very near Sam Clemens' great-grandmother Jane Montgomery Casey. It is well-documented that the Tom Sawyer character is based on the real adventures of Sam Clemens and his boyhood friends in Missouri, but we propose that our ancestor's name was known to Sam Clemens, either from reading it in the Iowa newspapers, or from having personally met the Sawyer/Snodgrass family, and when he wrote his book Tom Sawyer the name was not invented, but was recalled from Sam Clemens' memory, as was the name SNODGRASS, which Clemens several times used as a pseudonym. Thomas and Eliza's infant son Samuel died 3 March 1850 in Miami Co, OH and was buried there. They must have left Ohio very shortly after that, because Thomas bought land in Lee County, Iowa June 18 of that year and they are listed in the 1850 census for Lee County (enumerated Sept 17, 1850). They lived in Pleasant Ridge Township of Lee County 1850 to 1865; Montrose Twp 1865-1882, then bought a house in Keokuk and retired there in 1882. Thomas Sawyer was a devout Presbyterian. He was a leader in the West Point, Montrose, and Keokuk churches where he lived. He was chosen by the Presbytery of Iowa as a delegate to the General Assembly which met at Cleveland, Ohio in 1866. (3) Many of Sam Clemens' Iowa relatives were also Presbyterians. During Thomas' term the Iowa Legislature voted to move the state capital to Des Moines, and they adopted the State Constitution. This exciting news was published in all the Iowa newspapers and eagerly discussed by all residents. Thomas Sawyer's name was also in the local newspaper several times in 1856 and 1857 in connection with the Lee County Fair. He was Superintendent of Judges of Agricultural Productions. 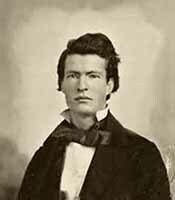 (See following section on Clemens Relatives in Keokuk and Lee County) Sam Clemens was interested in politics and local activities, and when he lived in Keokuk he likely read many Lee County newspaper articles about the election, legislative actions, and the County Fair. Thomas Sawyer's in-laws, Samuel and Martha Snodgrass, had moved with their children to Lee County, Iowa before January 1851 when they bought a lot in West Point and acreage in West Point Township. Samuel died in 1860, Martha in 1877. They are both buried in the West Point City Cemetery just yards away from Twain's great-grandmother's headstone. Thomas and Eliza Sawyer lived near West Point from 1850-1865. Thomas was the executor of his mother-in-law's will, and spent a lot of time in West Point working on her estate. Eliza Snodgrass Sawyer died in Keokuk in 1882 and Thomas Sawyer died there in 1892. Both are buried in Keokuk's Oakland Cemetery and their joint headstone still stands. Jim Ramsey relates an interesting family story about Thomas Sawyer and Samuel Clemens. The story was told to Jim's mother by his great grandmother, Isabella Horne Sawyer, wife of Thomas and Eliza Sawyer's son William. Isabella (1853-1939) and her family settled in Montrose, Iowa about 1857, and she and William Sawyer were married there in 1874. Jim's mother, Florence Gretchen McKee Ramsey, wrote the following: "According to my maternal grandmother, Isabella Horne Sawyer, her older brother met Clemens when they were both what she referred to as 'river rats' on the large paddle wheel boats constantly plying the Mississippi River in those days. They were frequent visitors for that period at the Keokuk home of Thos. & Eliza Sawyer." We have done research on Isabella's family in an attempt to verify this story. Of Isabella's four older brothers, Wilson Horne is probably the one referred to above. Wilson was a contemporary of Samuel Clemens; they were both born in 1835. Wilson lived in or near Montrose, Iowa. Prior to his enlistment in the Civil War in Keokuk in 1862, Wilson worked on a Mississippi riverboat. He was a laborer for Johnathan P. Barber, a riverboat pilot who lived in Montrose and piloted over the rapids from Montrose to Keokuk. (7) Wilson died in Montrose in 1866 as a result of pulmonary consumption contracted during the War. While living in Keokuk and working in his brother Orion's printing shop in 1856, the 20-year old Sam Clemens rediscovered girls and had an active social life. He took piano lessons at Mr. O.C. Isbell's studio on the floor below Orion's shop, and he joined a glee club. He lived for a while at Ivin's House on the river front, and later moved in with Orion. Sister-in-law Mollie's relatives--the Pattersons, Stotts and Taylors-- were among Keokuk's leading families and had several pretty, witty, and musical girls. (9) The Pattersons and Stotts were prominent members of the Presbyterian Church, and could have known Thomas Sawyer through the church. Sam Clemens' first, and reportedly hilarious, public speech was January 17, 1856 at a printer's banquet in Keokuk held on the anniversary of the 150th birthday of the famous statesman and printer Benjamin Franklin. Sam put an ad in the Keokuk newspapers in October 1856 reporting his find of a $50 bill. (10) It illustrates his reliance on local publishing efforts. This money eventually helped him to become a riverboat pilot. It is possible that Sam invented the pseudonym Thomas Jefferson Snodgrass after meeting our Snodgrass family. Samuel and Martha had a son named George Washington Snodgrass. Sam may have met George while in West Point to visit his great grandmother Casey's grave and his Casey cousins. Sam's memory of George Washington Snodgrass could easily have led him to think of using "Thomas Jefferson Snodgrass" when he wanted a pen name for his published letters (Mortals only copy!). Sam's many close relatives and friends prompted numerous return visits to Keokuk after his initial residency period of 1855-56. After a cruise to the Hawaiian Sandwich Islands, Sam returned to Keokuk, registered at the Tepfer House and on April 8, 1867 gave his Sandwich Island lecture at the Chatham Square Church which stood at Morgan & 7th Streets. (16) Orion's Keokuk law office at 5th and Blondeau was Sam's lecture headquarters. Many chairs were set up for visitors and "half the town dropped in". (17) Was one of these visitors our Thomas Sawyer?? Sam wrote at length about this visit in letters to the San Francisco Alta California newspaper and they were later published in Mark Twain's Travels with Mr. Brown. In August of 1870 Mark Twain attended the races in Keokuk. Sam started writing Tom Sawyer in New York in April 1874. (18) It was published in 1876. Jane Clemens moved into Orion and Mollie's large Keokuk house in September 1882. It was fixed up with generous financial help from brother Sam. Jane liked to walk and visit with neighbors. Orion lived at 628 High Street. Thomas and Eliza Sawyer were then living at 604 Grand Avenue, five blocks away. Sam had maintained close relationships over the years with the many friends he made, and drew heavily on those relationships when he began writing his many books. John Allen (J.A.) Casey, son of Green and Janie Casey and a first cousin of Samuel Clemens' mother, grew up in Lee County. He was Superintendent of Judges of Agricultural Implements for the Lee County, Iowa Fair in 1857. Thomas Sawyer was Superintendent of Judges of Agricultural Productions for the same Fair. (25) We can assume that the Superintendents attended meetings together, and that Thomas Sawyer and J.A. Casey knew each other. Jane Montgomery Casey's daughter Mary married John Creel. They also lived in Lee County. Their son Robert Paxton (R.P.) Creel was elected to the Iowa State House in 1854. Thomas Sawyer succeeded him in 1856, and was in turn succeeded by J.A. Casey. (26) Thomas must have known both of these men, who were related to each other and to the Clemens family. R.P. Creel was the father of Miss Ella Creel of Keokuk, who was friendly enough with her second cousin Sam Clemens to be invited to take a trip to New Orleans on Sam's Mississippi riverboat. William Casey Creel, a brother of R.P. Creel, lived very close to the Thomas Sawyer family in Pleasant Ridge Twp, Lee Co as seen in the 1860 census. Creel was on pg. 240 dwelling #39, Thomas Sawyer was on pg. 239, dwelling #29. It is very likely that these farmers knew each other. William Patterson, father-in-law of R.P. Creel, was a leader in the Presbyterian Church in West Point and later in Keokuk, and was active in politics for many years. He was elected as Iowa Territorial Representative in 1838, 1839, 1841, 1842, 1845. In 1857 he was a delegate to the third Constitutional Convention (27), and he was elected Mayor of Keokuk three times--1860, 1865 and 1866. (28). We know Thomas Sawyer was interested in politics, and it is likely that his interest included local Keokuk politics and politicians. Sam Clemens' mother Jane was the oldest grandchild and namesake of Jane Montgomery Casey. Jane Clemens was a first cousin of J.A. Casey, William P. Casey, R.P. Creel, and William Casey Creel. The last letter written by Granny Jane to granddaughter Jane the year Granny died invited them to visit her in West Point. (29) It is likely that Jane urged her sons Sam and Orion to travel to West Point to visit Granny Casey's grave and renew family ties with Casey and Creel relatives still living there. If Sam and/or Orion Clemens did visit their great-grandmother's grave and the Casey/Creel families, it is very possible that they also met the Snodgrass and Sawyer families who lived nearby. William & Eleanor Patterson (grandparents of Ella Creel) were original members of the oldest Presbyterian church in Iowa, organized June 24, 1837 at West Point. (31) The Sawyers and Snodgrasses were also members of that church. Since the Sawyers and so many of Sam Clemens' relatives were devoted and active Presbyterians, it seems very probable that they knew each other. Sam Clemens lived and worked in Keokuk for less than two years as a young man, but encouraged by his outgoing mother, he had close relations with the many relatives who lived in and near the town. That and the friendships he made so easily kept drawing him back to Keokuk for 35 years after he left. It is no wonder then, that he had so many memories of the people and the town, and it is no surprise that he recorded his memories in his many writings. We think one of those memories was of our ancestor, Thomas Sawyer. (1) Glickstein, Don. "Twain's Great Northwest Tour", Washington The Evergreen State Magazine. Vol. 3, No. 4, (December 1986). p. 47. (2) "An Unpublished Manuscript by Mark Twain", Life Magazine. December 20, 1968, pg 32. Rasmussen, R. Kent. Mark Twain A - Z. New York: Oxford University Press paperback, 1996, p. 37, 355, 384, 420. Varble, Rachel M. Jane Clemens, The Story of Mark Twain's Mother. New York: Doubleday, 1964, p. 25, 142, 158, 180. Hoffman, Andrew. Inventing Mark Twain, The Lives of Samuel Langhorne Clemens. London: Phoenix Giant Paperback, 1998, p. 191. Meltzer, Milton. Mark Twain Himself. New York: Bonanza Books, 1960, p. 174. Allen, Jerry. The Adventures of Mark Twain. Boston: Little, Brown and Company, 1955, p. 188. (3) History of Lee County, Iowa 1879. Chicago: Western Historical Co., 1879, p. 764. (5) Lee Co, IA Record of Incorporation, Vol. 1, pp. 108, 137-138, Lee County Courthouse, Keokuk, IA. (6) History of Lee County, p. 689. (7) Civil War pension file of Adeline E. Horne, Wilson's mother; History of Lee County, p. 757. (8) Hoffman, pp. 42, 44, 51-61. (10) Neider, Charles, ed. The Autobiography of Mark Twain. New York: Harper & Row, 1975, p. 103. Harnett, T. Kane. Young Mark Twain and the Mississippi. New York: Random House, 1966, p. 105. (16) "Keokuk and Samuel Clemens". Pamphlet printed by Keokuk (Iowa) Public Library, no date. (19) "Keokuk and Samuel Clemens". (23) Keokuk, IA newspaper article dated Aug 19, 1890. (24) Menke, Carolyn. "Great Grandmother of Mark Twain Buried in West Point", Gate City and Constitution. Keokuk, Iowa, Feb. 7, 1951. (25) Keokuk Valley Whig, April 22, 1857. (26) History of Lee County, p. 546. (31) History of Lee County, p. 667. (33) Ft. Madison District, Lee Co, Iowa, Deed Book 4, p. 720. (34) History of Lee County, p. 764. Written and contributed by Ann Stroupe and Jim Ramsey (contact information in paragraph entitled Summary).